Obituary for Charles J. Andalora | Rhoney Funeral Home, Inc.
Charles J. Andalora, of Sanborn, NY, passed away on Thursday, November 15, 2018, at his home under the care of his family and Niagara Hospice. He was born on the family homestead in Lewiston, NY, on June 26, 1936 the son of the late James and Lucille [Farinella] Andalora. 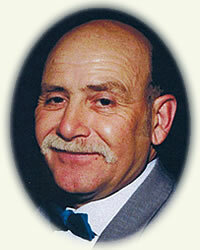 Mr. Andalora was an iron worker with Labor Local # 9 in Niagara Falls for over 38 years before retiring in 1994. He enjoyed spending time with his family, bowling, singing and playing his guitar and was an avid sportsman. Mr. Andalora was the husband of the late Catherine Rose [Fleming] Andalora, who passed away on November 25, 2014. He is survived by two sons Charles J. (Catherine) Andalora and Vincent J. (Karen J) Andalora, two daughters, Susan Rose (Grant) Obee and Debra M. (Richard) Blech, seven grandchildren Cory Cruise, Jesse (Caroline) Obee, Richard (Ashley) Blech, Jr., Darryl (Nicole) Blech, Kristin Blech, Eric Johnston and Kelli Young, eleven great-grandchildren Collin, Delaney, Keenan, Gabrielle, Allana, McKenzie, Cadence, Jayda, Christian, Lucia and Emma, also many nieces and nephews. He was the brother of late Alfred and Robert Andalora, Fony Wilson, Mary McCabe, Rachel Parfinski, Dorothy Pharis and Winifred Wolcott. His family will be present on Sunday from 2-4 & 7-9 PM at the RHONEY FUNERAL HOME, 5893 Hoover Road, SANBORN, NY, where Funeral Services will be held on Monday at 1:00 PM, with the Rev. James Bastian officiating. Flowers are gratefully declined. Memorials may be made in his name to Niagara Hospice. Interment in Gate of Heaven Cemetery, Lewiston, NY.